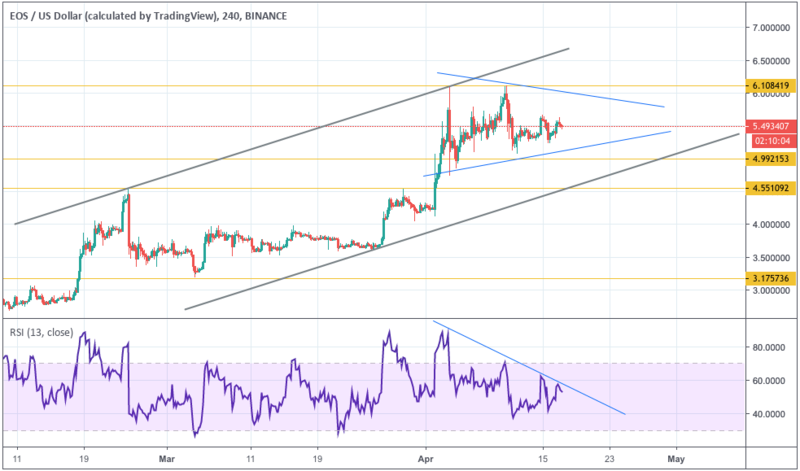 Cryptos are trading near their local highs, but still unable to go further, which may signal a near pullback. In case they do manage to go above the current highs, however, the ascending trend will surely recover in full. 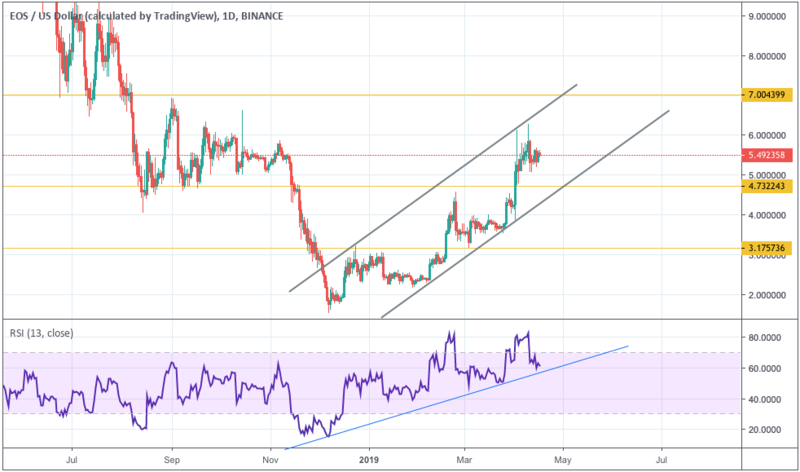 The analysts at Binance, one of the top crypto exchanges, say the market might have reached its current lowest mark, based on the historical data of 2014-2019. The CME, meanwhile, say investor engagement into the Bitcoin futures has fallen. On D1, the price is near the round number resistance of $6,000, which is also the long term descending channel upper boundary. BTC is now correcting upwards, and in case that boundary gets broken out, the uptrend may resume in full. The RSI has bounced off the support, signaling the ascending move is gaining momentum. A slight correction may be expected soon, but the price is then likely to get back. If $4,450 gets broken out, however, the long term downtrend may continue. On H4, a triangle is being formed, and the price may be going to test its lower boundary at $5,025. 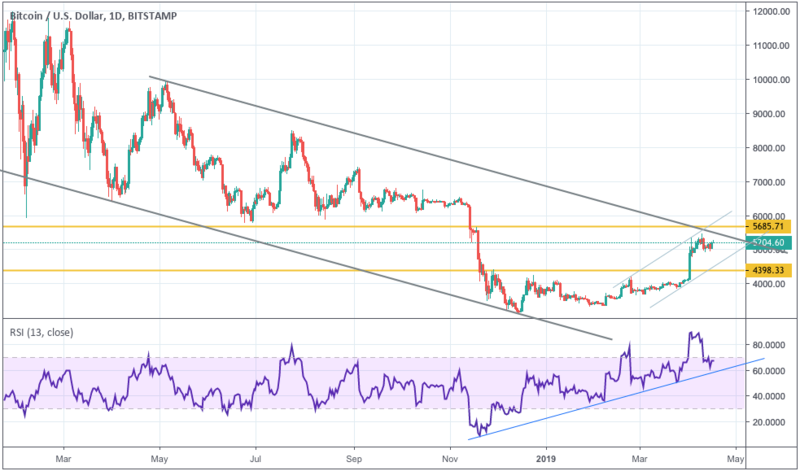 In case the upper boundary at $5,465 gets broken out, however, BTC may continue rising to $5,700, which may get confirmed with the RSI testing the support. 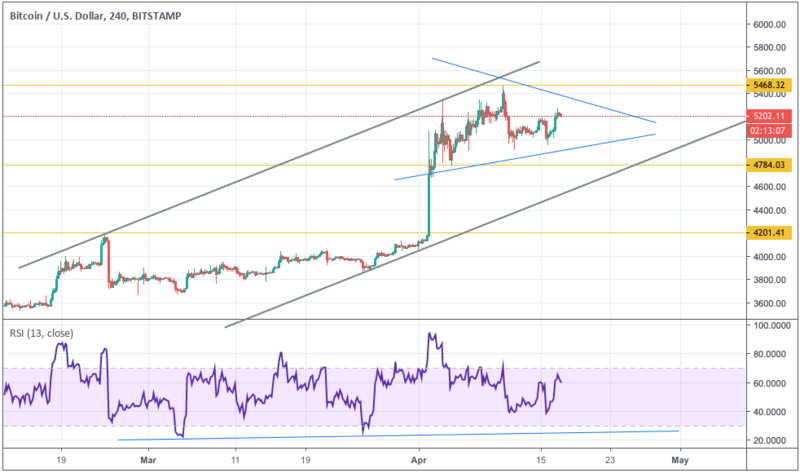 Conversely, a downside move will be confirmed once the bottom boundary of the triangle gets broken out and the price closes below $4,770, being then pushed down to $4,200. 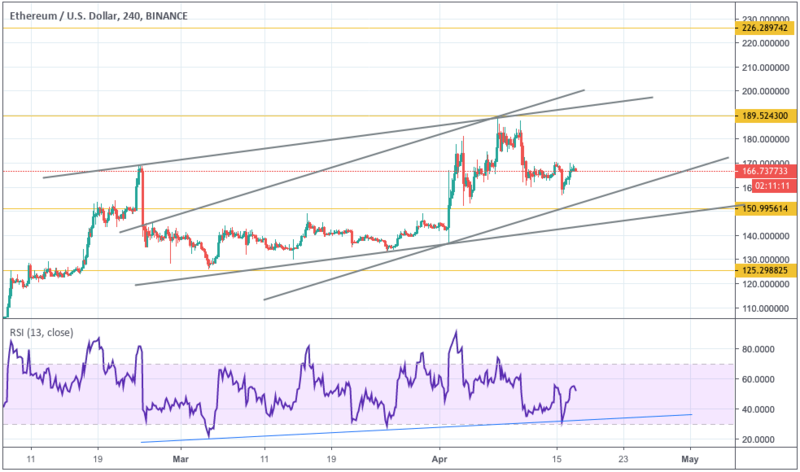 EOS is moving along an ascending channel, trading around $5.49. On D1, it may get down to test the lower channel boundary at $4.80, but only to then reach the target of $7.00. This will be confirmed if the RSI tests the ascending trend line. 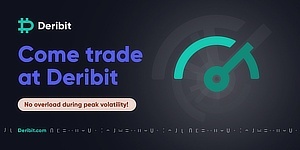 Currently, the relative strength is above the signal line, so the price may well reach the resistance at $7, break it out, and move ahead, unless the support at $4.75 gets hit. The latter may send the price down, making it break out the lower channel boundary and reach $3.15. On H4, a triangle is still being formed. 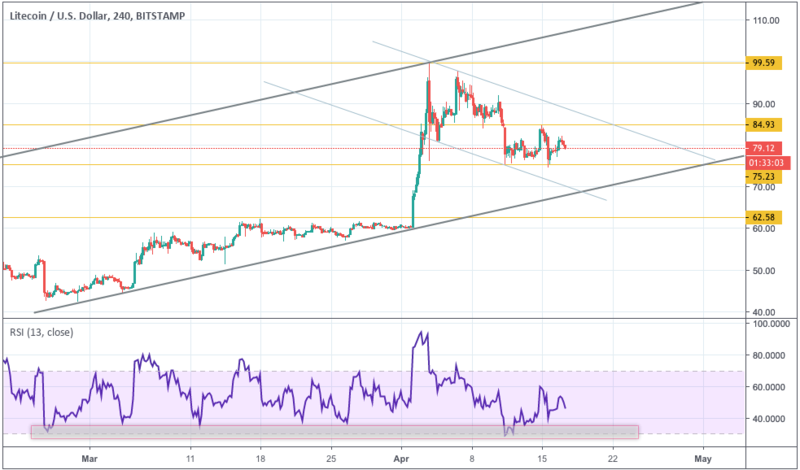 In the short term, the price is likely to test the lower boundary at $5.15, but only to then reach the target of $6.95, especially if the RSI tests the support. The resistance is at $6.10, and in case it gets broken out, the upside movement is likely to continue. Conversely, a downside move will be confirmed once the bottom boundary of the triangle gets broken out and the price closes below the support at $5 or $4.95, which might then send it to $4.55. ETH is currently correcting and testing $166. On D1, it may get down to test the lower channel boundary at $145, but only to then reach the target of $220, which is the resistance and the upper channel boundary. This will be confirmed if the RSI tests the ascending trend line. On H4, eth may get down to test the lower channel boundary. It might bounce off the support near $155, but only to then reach the target of $190, especially if the RSI tests the support. 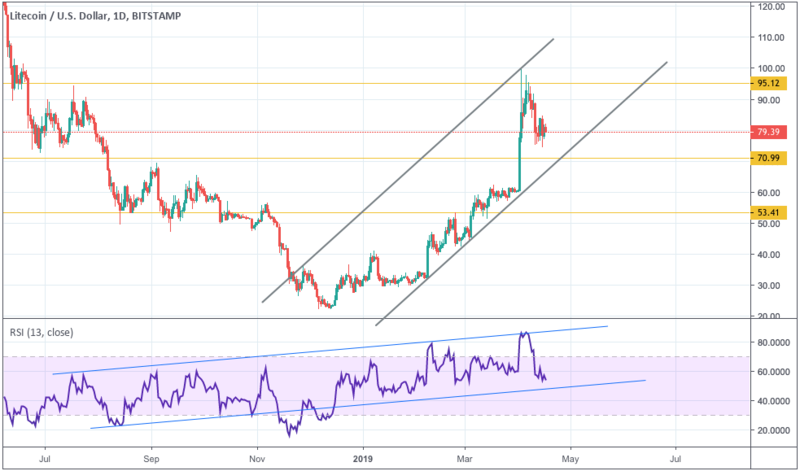 In case the resistance at $190 gets broken out, the price is likely to be sent further upwards, aimed at hitting the upper channel boundary, thus issuing a strong buy signal. Conversely, in case the support at $150 gets hit and the price closes below $145, the lower boundary might soon get hit, with eth going down to $125. LTC is correcting and moving down, while the lower channel boundary is not yet broken out. 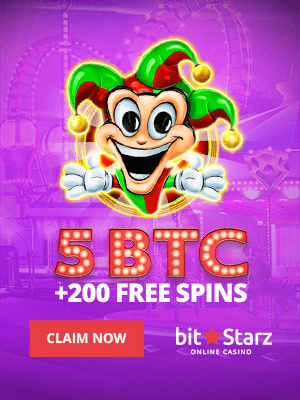 The crypto is trading around $79.39. On D1, it may get down to test the lower channel boundary at $70.55, but only to then reach the target of $100. The rise will get confirmed in case the RSI tests the support. The resistance is at $95, and in case it gets broken out, the upside movement is likely to continue, unless the support at $70.55 gets hit. Conversely, a downside move will be confirmed once the bottom channel boundary gets broken out and the price closes below $68, which will then send it to the support at $53.45. 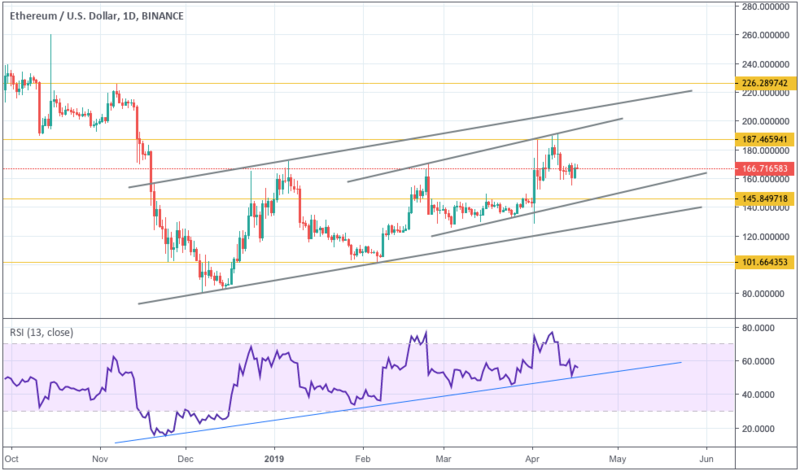 On H4, LTC is moving along a descending channel, and may test its lower boundary at $70 in the short term, but only to then reach the target of $100, especially if the RSI tests the support. The rise will also get confirmed once the descending channel is broken out and the price closes above $85. 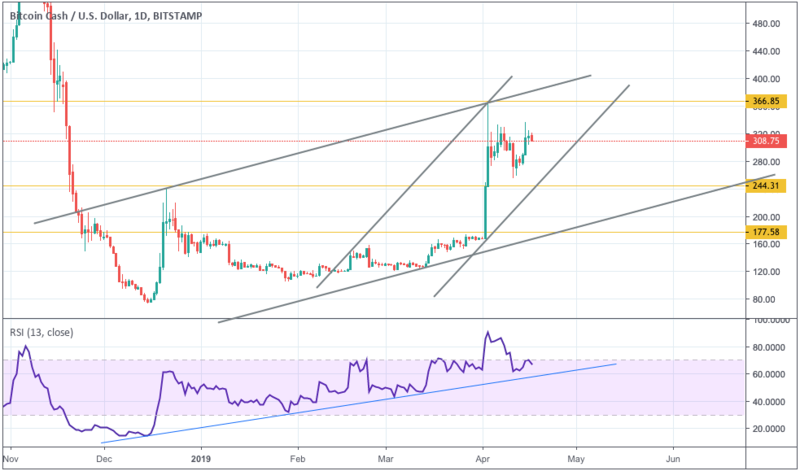 BCH is moving along an ascending channel, trading around $308.75. On D1, the price may correct and test the lower channel boundary at $275, but only to then reach the target of $400. This will be confirmed if the RSI tests the ascending trend line again (it has already been tested three times). Conversely, a downside move will be confirmed once the bottom channel boundary gets broken out and the price closes below $235, which will then send BCH to $177. On H4, BCH is moving down, ready to test the support at $255 in the short term, but only to then reach the target of $400, especially if the RSI tests support. 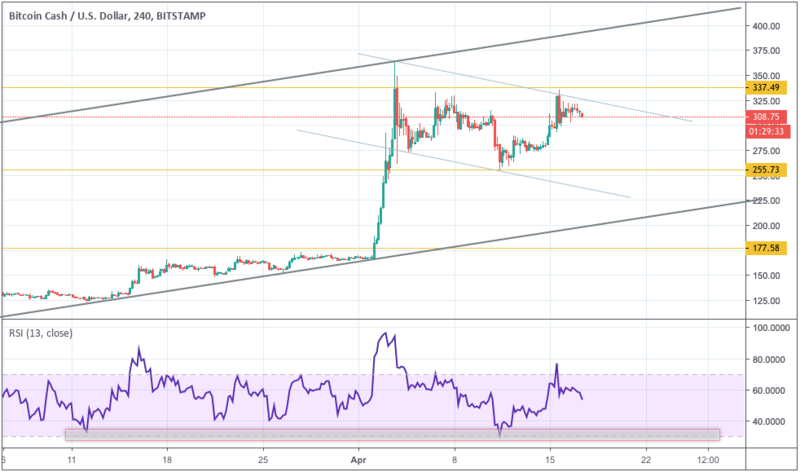 The rise will also get confirmed once the descending channel upper boundary is broken out and the price closes above $345. Conversely, in case the support at $255 gets broken out, this will signal a downside movement.